1. A Bout de Souffle (1959) was written by François Truffaut, who was also supposed to oversee erstwhile Cahiers critic Jean-Luc Godard's filmmaking debut, which stars Jean Seberg and Jean-Paul Belmondo. 3. Karina and Godard married in 1961, the year he cast her as the lead in Le Petit Soldat. 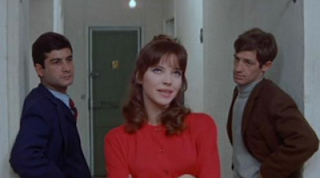 The release of his second film was delayed for two years due to its portrayal of the war in Algeria; in the meantime Karina starred in comédie musicale Une Femme est une Femme (pictured top, 1961) as a woman whose husband doesn't want her to have a baby, so she turns instead to his best friend, played by Belmondo. 4. Belmondo and Karina teamed up again for Pierrot le Fou (1965), part-gangster flick, part-road-movie, part-musical comedy portrait of the end of the the marriage of Godard and his star. 5. By the time of sci-fi flick Alphaville (1965), starring Eddie Constantine, Godard's love for Paris had dimmed and he used locations around the city as the setting for his dystopian vision of the future. 6. Godard has a bit of a thing for using prostitution as metaphor: for the acting industry in Vivre Sa Vie (1962), featuring a stand-out performance from his muse, Karina, and for living in Paris (Deux ou Trois Choses Que Je Sais d’Elle, 1966). 7. Deux ou Trois Choses… was made simultaneously with political movie Made in USA (1966), shooting one in the morning and the other in the afternoon. Karina is the girl with a gun in the latter, a multi-coloured noir film. 8. Godard makes an unexpected cameo in children's film Shéhérazade (dir. Pierre Gaspard-Huit, 1963), which stars Karina: 'The beggar walking on his hands is Jean-Luc Godard, in disguise of course, and without his glasses,' she says. 9. 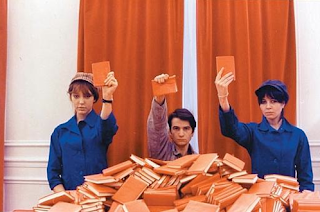 La Chinoise (pictured above, 1967) presaged the following year's student uprising although a year before JLG had been skeptical of consumerist apathy among 'the children of Marx and Coca-Cola'; Jean-Pierre Léaud is a winning lead amid the sloganeering of Masculin Féminin (1966) as if Truffaut's Antoine Doinel - name-checked here at one point - has had a lycée education. 10. In Passion (1982), starring Isabelle Huppert, narrative, sound and image are fragmented; other themes and appearances that can be traced across the films include, crucially, a preoccupation with pinball machines (notably also in Vivre Sa Vie). 11. Léaud, Nathalie Baye and Johnny Halliday are among the stars scurrying about in 1985's Détective, a Feydeau-esque policier where the hotel setting seems to serve as a potted version of contemporary France, much as the cruise ship takes on global connotations in his latest, Film Socialisme.